VpCI-387 is a high-build topcoat that provides long-term corrosion inhibition for metal substrates in tough atmospheric conditions. VpCI-387 is excellent for applications that require a thicker coating for added physical protection. VpCI-387 can be applied directly to metal or used in conjunction with a primer (provided compatibility has been checked). VpCI-387 has excellent UV light resistance. VpCI-387 is available in custom colors. VpCI-387 must be thoroughly mixed prior to use. Apply by brush, spray, or roller. Normal WFT of 13-15 mils (325-375 microns) yields 6-8 mils (150-200 microns) DFT. Product cleanup: Use soap and water to cleanup tools and overspray. **Dry to Recoat Time: 4-7 hr. *The physical properties vary for the custom color versions of VpCI-387. Note: Coating dry time is affected by temperature, air-flow, and humidity. Hose should be 3/8" (0.95 cm) I.D. minimum, but a ¼" (0.64 cm) I.D. whip end section may be used for ease of application. A maximum length of 100 feet (30.5 m) is suggested. Best results will be obtained using a 0.013"-0.017" (0.3-0.4 cm) tip at 1200-1700 psi (83-117 bar). Avoid using VpCI-387 in situations where the coating is immersed in water or other liquids as this could lead to softening of the film. 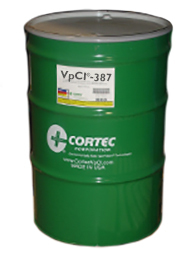 Available in 5 gallon pails (Cortec Product # 12500521) or 55 gallon drums (Cortec Product # 12500522). 5 gallon drum weighs 50 pounds and ships under our standard shipping rates. The 55 gallon drum must be shipped by truck. We will provide you with a freight quote before we ship this product. Do not allow product to freeze.